What can I Recover in a Construction Accident Case? Thinking About What You Could Get In An Illinois Construction Accident Case? Rehab and other long-term care. Prescriptions, medical devices, other prescribed measures. Psychological care or other necessary consultations. Non-economic damages are a wholly and distinctly different breed of compensation than economic damages in Illinois construction accident cases and, in fact, all other kinds of cases. Sometimes called general damages (economic damages are alternatively called special damages in certain circumstances), non-economic damages aim to reimburse a victim of a construction accident for the way in which an incident substantially changed their life for the worse in an intangible way. It can be thought of as compensation for a reduced quality of life. Inability to take care of yourself. Inability to continue working . Inability to have relationships in the same manner that you used to be able to. Inability to complete actions you used to be able to complete. While some jurisdictions have tried to reduce plaintiffs' ability to recover for non-economic damages in construction accident cases, you should still speak with your lawyer to see if you can and by how much you can. This kind of injury can come in a myriad of forms; therefore, it is important to identify how you have been injured in a non-economic manner and then to try and recover for it. It should not be hard to remember the goal of punitive damages because it looks a lot like what it is supposed to do: punish. In contrast to economic and non-economic damages, punitive damages have no relation to the way in which a plaintiff was harmed, at least in the way in which the court calculates them. Rather, they are designed as punishment for the wrongdoer and are meted out in amounts equal to the defendant's egregiousness. Company uses materials it knows are dangerous to its employees to save money. The company fails to update or maintain its equipment to such an extent that it knows those who use it are in danger. The company allows its employees to operate equipment or drive vehicles while intoxicated . The company does not follow the law when erecting scaffolding or working on a building and employees fall as a result. 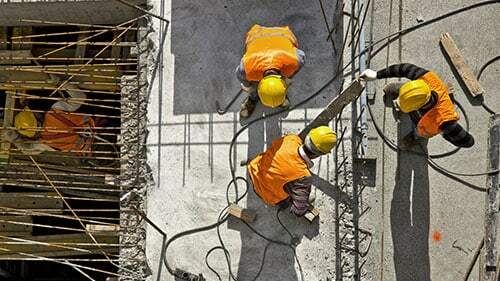 Just like with non-economic compensation, state legislatures and courts have made attempts to reduce a worker's right to receive punitive damages in construction accident cases; therefore, check with your lawyer if they will be available to you. Lost wages/income due to the decedent's death. Lost companionship due to the decedent's death. Lost support due to the decedent's death. Workers' compensation is most closely analogous to insurance. It provides compensation for lost wages, benefits, health care, and other items to workers if they have been injured on the job. The catch is that in many instances you must forfeit your right to sue your employer if you accept workers' compensation for your construction accident. However, the process of workers' compensation is often "no-fault" meaning that workers do not have to prove it was someone else' fault or that it was not their own fault; therefore, this can be an easier route to compensation than litigation in certain instances. It is very important that you discuss with your attorney the differences and opportunities that both litigation and workers' compensation afford you. Not every form of compensation or damages will apply to your construction accident. Thus, at the beginning, you should look at the particulars of your incident with an attorney to identify to understand which will apply. Here are some reminders to think about when you are completing this process. 1. Did the defendants act particularly egregiously? If they did, you might be able to sue and recover for punitive damages. 2. Did the incident take place during the course of employment? If it did, then you might need to file for workers' compensation instead of filing a lawsuit for damages. 3. Did the construction accident change your life negatively in intangible ways including scarring, disability, or pain and suffering? If it did, then you might be able to sue for non-economic damages. 4. Did someone you love die in the construction accident? If so, then you could possibly sue for wrongful death damages in Illinois. Hopefully, this gives you a better understanding of the kind of compensation you can obtain for your construction accident in Illinois, whether it is through a lawsuit or workers' compensation. Yet, all cases are different so carefully review the facts and circumstances of your own incident to determine which route will be the best for you. Rosenfeld Injury Lawyers LLC focuses on helping personal injury victims in Illinois including those that have suffered construction accidents. We see the significant consequences that they impose on the people that they affect. That is why we represent them on contingency-so that they don't have to worry about a nickel of charges until they get the recovery that they need and deserve. Call Rosenfeld Injury Lawyers LLC today to learn about how we can begin setting the wheels in motion for your compensation. Are There Time Limits on Construction Accident Cases? What Are Common Construction Accident Injuries? What Are Construction Accident Laws? What Are Construction Accident Statistics? What Have Other Construction Accident Plaintiffs Recovered in Court?